I want to uninstall the GMail webapp, and I tried both the ways given in this question, yet still I'm unable to. When I searched the Software Centre for unity-webapps-gmail, I saw that it wasn't installed. And the "allowed-domains" in dconf-editor had no website. The Gmail icon shows up here under the Messaging Menu, and opens GMail in Firefox when clicked. 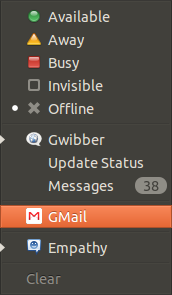 How do I unistall the Gmail web-app so that it no longer appears in the Messaging Menu? I was wondering the same thing in Ubuntu 14.04. Turns out, the unity webapps are stored in /usr/share/applications now. AT YOUR OWN RISK: If for some reason you'd like to remove this you could replace echo by rm (and make sure you have appropriate privileges). Not the answer you're looking for? Browse other questions tagged 12.10 webapps or ask your own question. Are WebApps not working as intended?